Detective Kevin Wiese has once-again bravely volunteered to be our officer behind bars for this year’s Cage-A-Cop event to be held December 21-23 at Village Pointe Shopping Center. In addition to braving the cold and holiday shoppers for Special Olympics Nebraska, he will be representing Nebraska Law Enforcement in South Korea for the 2012 World Winter Games! 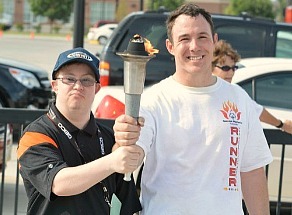 How did you first get involved with the Nebraska Law Enforcement Torch Run and Special Olympics? At my first Torch Run, I spoke with the parent of an athlete who had just gotten out of school. The athlete needed confidence and Special Olympics changed his life. I’ve been involved for 5 years now. What is your favorite Special Olympics event? I like track and bowling. I volunteer at bowling events. What are you looking forward to most in South Korea? I’m excited for the actual Torch Run where I get to see everybody and the whole social aspect. And I love that it’s for a great cause. I don’t really know what to expect in Korea, but I’m excited to interact with people from all over the world and international athletes. Tell us about the Final Leg run you will be participating in Korea. We’ll be running all over the nation. I know that my team leader is from Ireland and I have a running mate who is a Korean officer. Have you ever eaten Korean food? Is there any food you really want to try? No – and I have no idea what to expect! I’m not afraid to try everything. Moving on to Cage-A-Cop…this is your second year “behind bars”. What is it like spending a weekend in a cell? It gets long and cold. I really like that I get to talk to a lot of curious people. Last year I even lost my voice! I love talking and I even sang with the carolers last year! What do people ask you when you’re in the cell? They want to know what I’m doing it for and I’m happy to explain that I’m supporting Special Olympics and why I do it for the athletes. They also want to know why I would stand in the cold for an entire weekend. Click here for more information about our Cage-A-Cop 2012 event!